Gaddafi’s gory picture on the front page of papers is a sign of the times. Blood thirsty, war mongering puppet masters, trying to juice up a naive crowd. We are truly a military nation. Is that really who we want to be? This (OWS movement) is a call to (political and spiritual) consciousness. As a Spiritually oriented person, I feel impelled to pray, meditate and do other activities that raise my Consciousness, thereby developing my internal world. “Prayer and action” said a wise Sufi sheik. We cannot leave this world to the devices of those who only know the mundane (materialistic) life. This is why OWS is very timely and relevant. To be spiritually and politically active simultaneously is a healthy way of being, and provides a positive force in the world, which impacts one’s own life as well as that of others. Regarding the ‘mundane life’, the point is that most of us who live in modern cities (like New York City) have quite active lives, socially and professionally. We have our hobbies, educational pursuits, family lives and career ambitions to occupy our time. Occupy Wall Street is about creating space for political, social and spiritual Consciousness. Separation of church and state may have worked to induce a more seamless capitalist system of markets, but it has in the process (BY DESIGN) stripped away the essential moral fibers that keep any system in check, holding them to the light of ethical scrutiny. We (in the West, and the US especially) have been induced and enticed by these dark forces of disintegration, which have fragmented people and systems, piece by piece. Every man, woman and child for themselves. It is a devious (and brilliant) plan that has worked for many years, working its black magic by infiltrating our institutions of government, media, religion, education and when necessary, military (brute force) to carry out the program. The fact that we all have these busy, engaging lives is PART OF THE PLAN. Keep us all distracted and part of the Paid, Upper end of the Pyramid scheme, so that we won’t say anything about the abuses happening ‘under the table’, at the bottom of the food chain. We, the 99%, are conspirators in this Ponzi Scheme, as we all aspire to “move up” the ranks, even if that means stepping on someone else’s throat to do so. “Nice guys finish last”, remember how we’ve been taught those precious, Machiavellian lessons? Have you checked into your hard drive (unconscious memory) recently, to see what kind of cultural messaging is still deeply embedded? Would re-integration of church and state solve our problems? No. Modern day religious institutions, for the most part, are complicit in the big scheme. They do not carry the Essence of true Spirituality, in the vision of the Prophets, peace be upon all 124,000 of them, who appeared during equally troubling times in human history to bring light to human fallacy. In our lifetimes, we don’t have those beams of light to guide us away from error – if we did, we would be too busy to take notice anyway! Even for those of us who have partially ‘woken up’ from our unconscious slumber, as did Neo in the Matrix, and harbor serious doubts in our hearts about how our society is being run, the question remains – will we stand up for real change? Well, thank God, a movement has started, which is inspiring people to WAKE UP, not go back to sleep and take up real, transformative action. 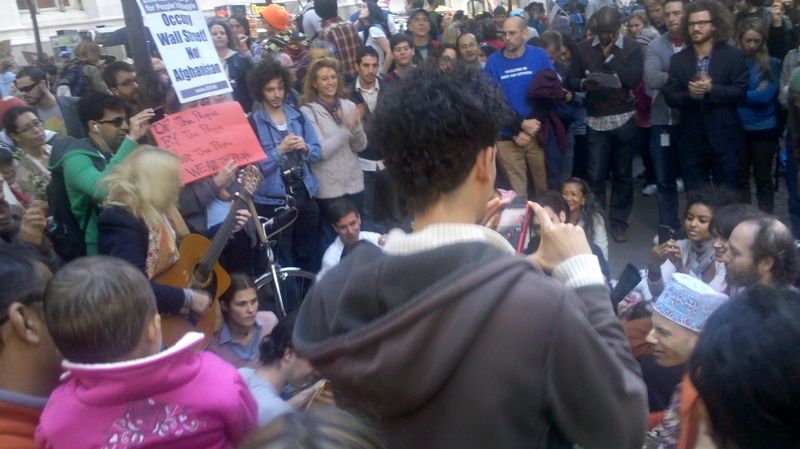 The ideas being discussed at OWS are as practical and humanistic as what those messengers brought to humanity years ago. Read the words of any Prophet, and you will find the seeds of democratic, ethical human affairs in them. From land and wealth distribution, to systems of governance, to how we should spend our time, to human relations, it was all laid out, from the Highest Source. And we, on a collective level, have not been following it recently (for at least the past 50 years of humanity). This brings to mind the importance of the 1%, at the top of the food chain. Leaders of nations and major organizations are the key holders and most influential stakeholders of that group. Their decisions carry the most weight for the direction of humanity, which is why we cannot sit back neutrally (ref. Zinn) and just mind our own business. YES, we need to develop or own internal worlds, in the midst of whatever chaos is going on outside – that is the #1 priority in my opinion, and what I hold to in my own life. But once we have attained a relatively high level of awareness, the next priority, as Plato urged in The Republic, is to take it to the streets, our own communities, and become active citizens and helpers of mankind. We have to either throw out the 1% or transform them, as we transform ourselves not to be passive sheep, in a herd that is currently en route to nowhere. Ruthless, profit (only) seeking, corporations and laws that enable them to continue pillaging Mother Earth, have to be stopped. How long can we put profits (of the 1%) over people (99%)? Seeing the reality of what is happening and letting it sink in – really hit the heart – can bring about all kinds of emotions, from sadness to rage. Anger, as Deepak Chopra said recently about the Occupy Wall Street movement, is being channeled into Awareness, which is why these protests are peaceful. OWS is a thoughtful, creative and powerful response to years of abuse and manipulation. As Naomi Klein said recently on OWS, “this is the most important thing in the world right now”. The 1% is having trouble with this, trying hard to find some targets (“who is the leader?”) and vulnerabilities, so that the other 90% who are not aware of the charade yet, or at least not mad enough to speak up about it, don’t catch wind of what is going on. That is why we’re seeing some belligerent responses, and intimidation tactics [ie. think of bullying, mace-spraying police forces]. Let’s keep it peaceful, but no less energetic and emotionally charged. Being angry is justified. Channeling that emotion into thoughtful action and service of humanity is the greatest challenge of our time. And the time to embrace that challenge is upon us.